Family lore holds that Manuel was a Yaqui Indian, and the only family photo we have of him confirms strong Native American features. The undated photo shows him with short hair and wearing a suit, which would indicate he was “westernized.” We know he was not a full-blooded Yaqui based on male line DNA testing linking our male line back to Western Europe, and specifically Belgium. The testing linked our male line within one marker to three individuals, all with the last name Fimbres. 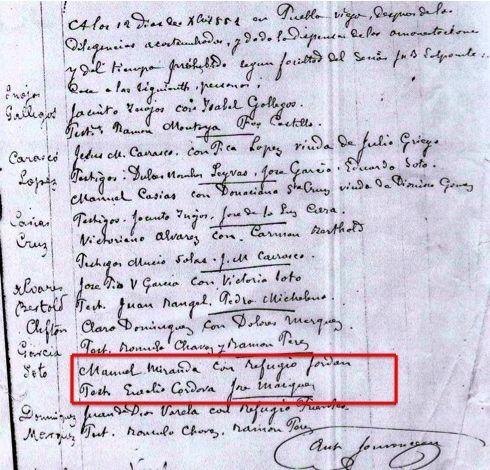 These individuals have traced the Fimbres name from Sonora, Mexico back to the Basque country of Spain and ultimately to a Johannes Fimbres in 17th Century Belgium. Therefore, the theory is that Manuel’s father was a Fimbres but only fathered him and was otherwise completely absent. As a result, Manuel carried the last name of his mother. What is certain is that as a resident of Arizona in the early 1880s, Manuel was one of the earliest settlers of the Territory. There is a Manuel Miranda listed in the 1880 census for the town of Clifton in Arizona Territory with a date of birth within a few years of our Manuel. The head of household is an L. Miranda, and Manuel’s relationship to the head is noted as “illegitimate.” The last fact would be consistent with the above noted theory regarding the Miranda-Fimbres connections. 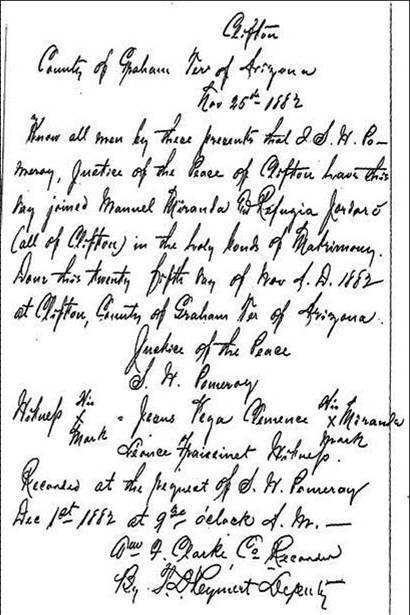 In addition, with a population of only some 600 people in the town of Clifton at the time of the 1880 US Census and the fact that a Manuel Miranda was married in Clifton just two years later (see details below), it seems very likely that this is “our” Manuel. 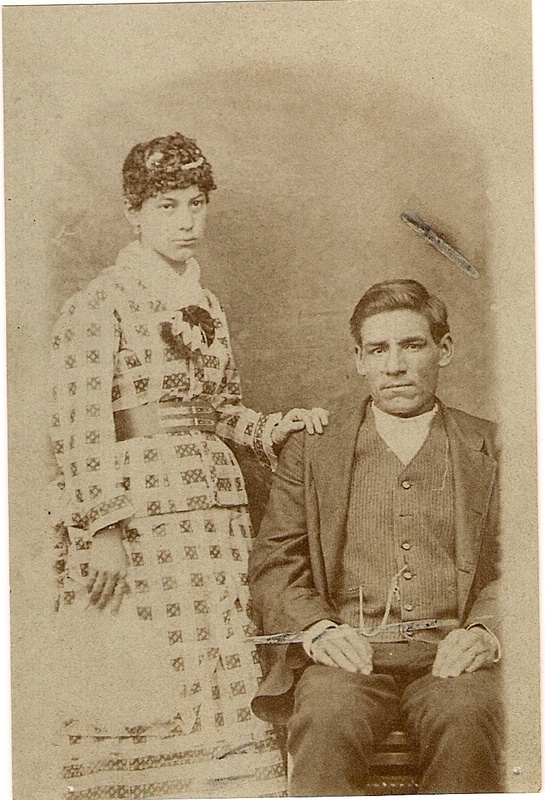 According to his civil marriage record, Manuel married Refugio Jordan on November 25, 1882 in Clifton, Arizona. The record notes that he was from Clifton, which could be further proof that he was born in Arizona Territory. The Justice of the Peace performing the wedding ceremony was named S.W. Pomeroy, and witnesses at the event included Jesus Vega, Clemence Miranda, and Leonce Fraissinet. The church record appears to date from 1882 as well. The record includes eight marriages that seem to have been celebrated on the same date, which could be due to a shortage of priests in the Territory at the time, who were forced to cover many small towns within the Diocese (in this case Tucson). The witnesses to the wedding were Eusebio Cordova and Jose Marques. The only documented information about his birth that we have comes from the 1900 census, which lists his date of birth as April 1855 in Arizona Territory. It also confirms that by 1900 he had been married for 17 years and had only one child (Francisco). 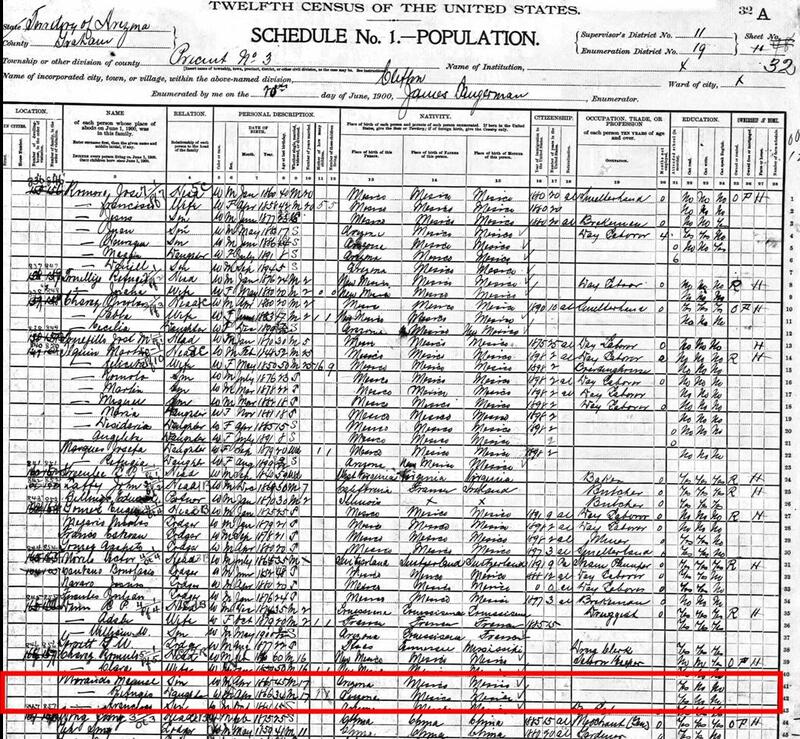 There is also no mention of a “year of immigration,” which could confirm his birth in Arizona Territory, although there is general agreement that information from the census is not entirely reliable. There is no listed occupation, which seems odd considering he was about 45 at the time. The census also notes that he could read, but neither write, nor speak English. Manuel is listed on the wedding record for his son Francisco in 1904, although not on the invitation. 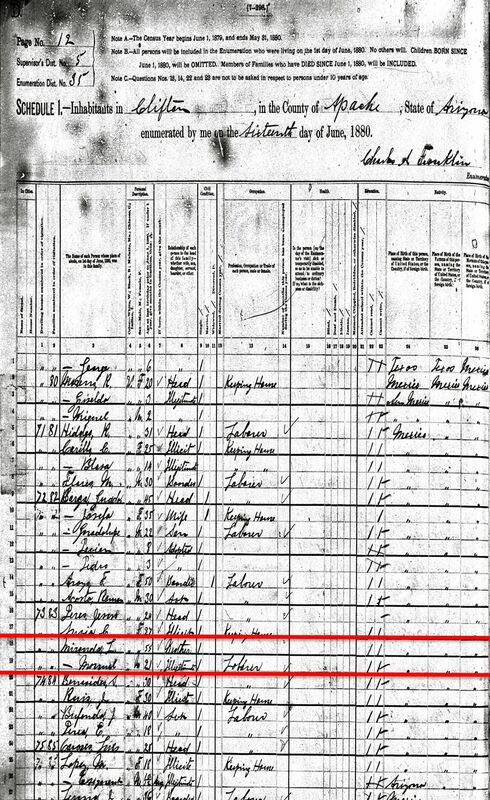 In the 1910 census, Refugio is listed as widowed, and so Manuel is presumed to have died between 1904 and 1910. No death or burial record was found at the Sacred Heart Catholic Church in Clifton. A Clemencia Miranda, who was a witness at Manuel’s marriage to Refugio, died in Clifton March 1900 at the age of 52 – she is possibly a relative, but we have found no further information on her.